If you've opted to upgrade to a personalised dust jacket, please add the baby's name/s and we will add that to the cover and spine. Contemporary baby journal, record book, baby memory book and pregnancy diary in one – a modern gift to fill in and look back on forever. 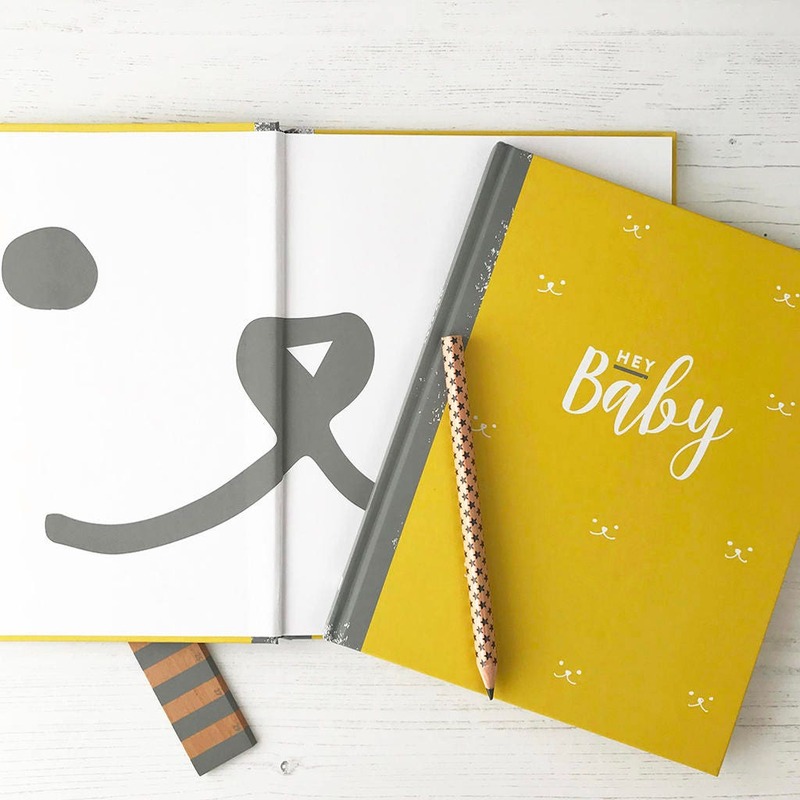 The brand new, updated edition of the best-selling contemporary baby journal and record book in one with updated design and features throughout and a sweet teddy face motif. This Baby Journal and Record Book is a great new baby boy or girl gift, or the ideal present for a birth announcement, baby shower, new parents, christenings or first birthday – with room for notes and wishes, photos and scans. And there’s no need to complete it in order. You can record even more moments in pregnancy and a baby’s first year. Start with a note to the little one, then a timeline, and remember the pregnancy with features to capture the due date, names considered and nicknames for the bump, along with a new labour countdown and gender reveal. There’s a ‘birth announcement’ with even more facts on the new arrival from date to weight, location, eye and hair colour and more (including ways to record the early days!). You can add some details on the family, have fun with an awards ceremony (champion nappy changer included! ), include wishes for the baby and record the things that made you all smile. There is dedicated space for scan photos, first hospital photo, that ‘nakey baby’ must have, precious sleeping pic and first birthday shot. The first birthday review finishes the book with all the milestones of the first year – sitting, standing, crawling, walking, first words, favourite toys, activities, the key information about the year and more – complete with a ‘review in photos’. You’ll also find advice on the ‘things no-one tells you’, pages for handprints and footprints and a special baby shower page. There’s also plenty of flexible space for more images, messages and more. We also have Baby Journal and Record Books in Blue and Pink (all pages are gender neutral). Your book is beautifully finished with a hardback cover with velvet-smooth soft-touch laminate and heavy matt uncoated paper pages for that top-quality feel. All our books are designed in the UK. Portrait book 20 x 25cm with 52 pages to treasure forever. Why not add a pack of our NEW matching Milestone & Memory cards? The perfect little extra for snapping and social sharing. Looking for something for older siblings? You could add our Family Memory Book to keep recording the memories and milestones for the whole family! ORDERING AS A GIFT? We can also wrap your order in our high-quality linen-look paper, and send direct to the recipient with your message. Well made and so fun! Gorgeous book, would have loved one for my babies! Super cute book with great prompts throughout the book. Love it!